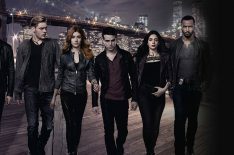 There are only a few episodes left before the midseason finale of Freeform's Shadowhunters and we can't wait to see what's next. What will happen in Tuesday's episode, "A Heart of Darkness"? Will the gang defeat this season's big bad Lilith (Anna Hopkins)? Will they be able to snap Jace (Dominic Sherwood) out of his evil trance as The Owl? Only time will tell. In other Shadowhunters news, we also got a glimpse into werewolf Maia's (Alisha Wainwright) past last week — specifically, the sad story of how she became a Downworlder in the first place. Thanks to Praetor Lupus' Jordan Kyle (Chai Hansen) re-entering Maia's life as Simon's (Alberto Rosende) now-roommate/protector, things have all gotten a little awkward. TV Insider talked to Wainwright about that awkwardness and shooting scenes by the seaside. How was it shooting last week’s episodes? Sitting on the beach for once must’ve been nice! Alisha Wainwright: Yeah, it was actually really funny. When we were doing our live tweeting [during the episode] a lot of the tweets were about how the coloring of the scenes had such a light and happy vibe. It was such a stylistic departure from the show; it felt like we were doing something else entirely. But of course being outside on location was great. It was super cold on those days unfortunately, but we made the best of it. I’m just really glad everyone can finally see the visual behind what was Maia’s point-of-view from Season 2, which is that monologue in Episode 18 [“Awake, Arise, or Be Forever Fallen”] where she explains how it happened. In Season 3 you’re like, ‘OK, this is really how it went down.’ It’s not different from what she said, but you can kind of see how there are two sides to every argument. Where were you actually shooting those beach scenes? That wasn't really the Jersey Shore, right? [Laughs] No. We were actually on the Lake Ontario coastline, a little east of Toronto. Great. So what’s in store for this week’s episode? When we wrapped up the end of last week, Maia made it very clear that Jordan’s not to repeat his abandonment and is to stay with Simon. But also, Maia’s dating Simon. So next episode you’re going to have another one of those awkward situations like the Jace-Clary, Maia-Simon double date. This is a very different take on awkwardness though, because Maia’s still trying to reconcile how she feels, while also having a boyfriend that her ex-boyfriend has to help. She's trying to resolve this past by bringing Jordan into her life, but you find out in this week’s episode if it’s really possible to do that. We dove into the logistics of that. What does Jace's sinister side mean for his future with Clary? Does she regret letting Jordan stick around? No, I don’t think so. It’s scary for her, but also I think in the end she knows that it’s the right move. That’s how you cross out pain and suffering, by not ignoring it and trying to push forward instead. Now Maia, Simon, and Jordan team up on the hunt for Lilith in tonight’s episode. What can you tell me about that? So, you know in last episode that Simon’s mark obviously plays a really crucial role in what is inhibiting Lilith from being able to do exactly what she wants. Simon knows that his mark is involved in that somehow, and he will invariably take them to the scene of the crime to try and figure out what’s wrong. He’s scared that he could hurt someone with this mark, but everyone else realizes that this mark could serve more of a beneficial purpose than not. The mission is to find out what’s the endgame that the Seelie Queen (Lola Flanery) has in store and why she put [the mark] on him in the first place. What’s going on with Magnus (Harry Shum Jr.), the Lightwoods and what used to be Jace? It’s funny, I was talking about the show with my mom this afternoon and she goes, ‘This new Jace – I don’t like him. It really scared me that he would do something like that to Clary [Katherine McNamara].’ These people, their love is the canon for the show, and to see him be this evil, savage person is wild. Fortunately, he has this group of people around him who are A) physically controlling him in one place and B) love him very much. And deep down inside Jace is the real Jace. I think leading up to the season finale, it will be about trying to free the real Jace from this evil one that has taken control. Plus, the actor chats about those sparks flying between Luke and Maryse Lightwood. Can you tease anything about the finale episodes that this is all building towards? Technically, Maia is not in those episodes. We have so much to tackle with the other storylines too, but there is a reason why she has to do other things. So, I can tease that, the resolutions get made, but in the Shadow World when resolutions get made, it comes at a cost. In our midseason finale, I think that they were really good about wrapping up stuff, while also introducing new debacles. What is the most fun thing about shooting those awkward scenes with Alberto and Chai? Do you break all the time or are you pretty good? We’re pretty good. Outside of work, we have the best chemistry as friends, so it’s actually quite funny having to play these awkward moments. The awkward dinner date in Episode 2 was just awkward because it was uncomfortable, whereas this awkwardness is so much more layered. We can’t deviate from it so far that it’s funny. There’s not a lot of room to laugh and smirk. Once we finish a scene though and we’re off sitting in our cast chairs, we’re playing games, we’re teasing each other and we’re goofing around.